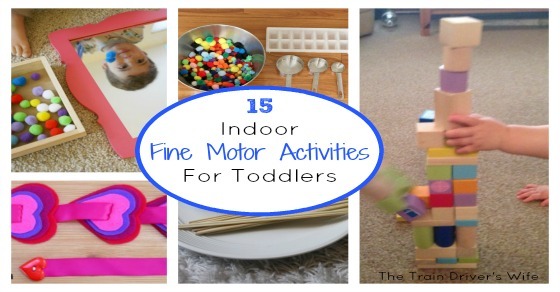 After our fun round up of 15 Indoor Gross Motor Activities for Toddlers I couldn’t resist a round up of Toddler Fine Motor Activities too. The term “Fine Motor Skills” refers to the small movements we make with our hands which enable us to do day to day things, such as holding a pencil or using cutlery. Developing these skills is important, as they enable toddlers to build the co-ordination and strength they will require to further their learning in writing, drawing and hand eye co-ordination. Toddlers can build on these skills through some awesome play activities, some of which I have included below. Little ones will love this colourful Fine Motor Pom Pom Scoop from Buggy and Buddy. Practice stacking (and knocking them down again) with this fun Building Blocks Activity. Pom Poms are great, but adding a mirror makes them fantastic! Check out this Fine Motor Pom Pom Mirror Play from Buggy and Buddy. This Tong Transfer Game from Mama Papa Bubba is a fun and simple way to build hand strength and co-ordination. Work on scooping skills with this simple Fine Motor Pasta Scooping activity. This Pipe Cleaner Posting activity from Adventures of Adam is a great way to build hand eye co-ordination. Nothing encourages my toddler to practice scooping better than adding water, try this Fine Motor Ball Scoop. Practice threading and create this funky Fine Motor Straw Necklace from Mama Papa Bubba. Snack time can be a great time to practice scooping with this Fine Motor Raisin Scoop. This Homemade Household Objects Puzzle from Mama Papa Bubba is perfect for developing hand eye co-ordination. Toddlers can practice pinching, grasping and dropping with this Toddler Pom Pom Play from Adventures of Adam. This Vehicle Colour Match Busy Bag from Something 2 Offer is perfect for grasping and picking small objects, and learning colours too! Practice threading and master buttoning with this Threading Hearts activity from Adventures of Adam. This is a super simple Fine Motor Threading O’s activity from Mama Papa Bubba. Practice pushing, pulling and turning with this fun Transport Sensory Table from Learning to Walk. I hope you enjoy these activities too. 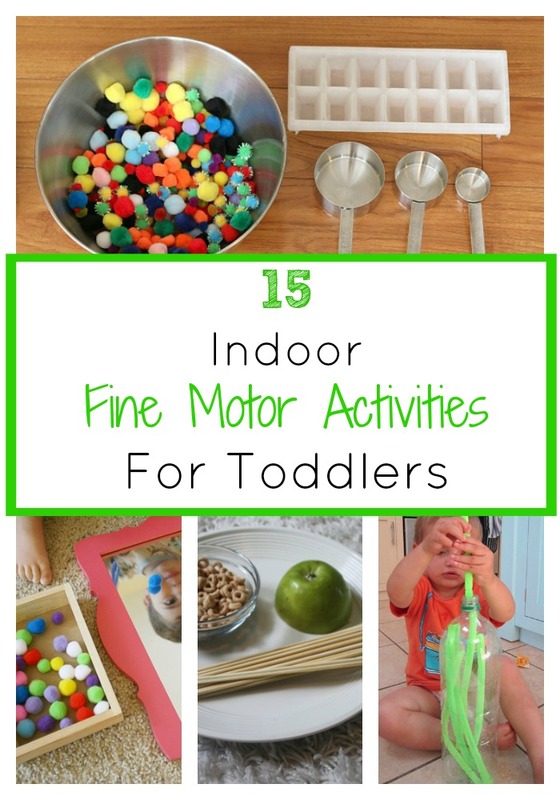 Don’t forget to check out our 15 Indoor Gross Motor Activities for Toddlers, 15 Indoor Sensory Bins for Toddlers and our 15 Indoor Arts and Crafts for Toddlers too. This is great! I am looking for ideas to work on fine motor skills with my toddler. He’s going to love these! I’m going to have to get some of those Pom-pom’s. Pinning! I’m so glad you enjoyed them Tricia, I hope your toddler does too! Yes! Very creative! I love your ideas! So many to try with my little one!